Photo: Eliza G. Yount House, ca. 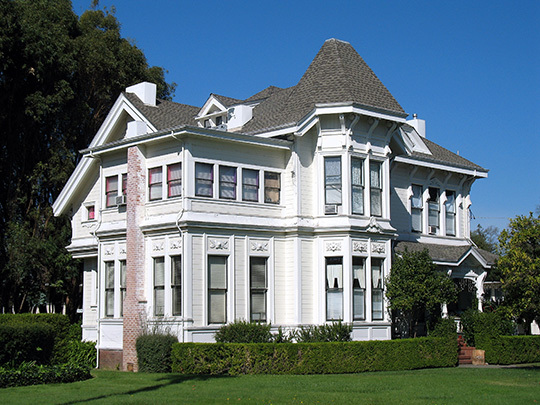 1884, 423 Seminary Street, Napa, CA. Listed on National Register of Historic Places in 1992. Photographed by user:Sanfranman59, 2011, (own work) [cc-by-3.0 (creativecommons.org/licenses/by/3.0)], via Wikimedia Commons, accessed December, 2014. The Napa County Courthouse is located at 825 Brown Street, Napa, CA 94559; phone: 707-299-1100. The modern development of Napa County began even before the formation of the county (one of the original California counties). Early developers tried a number of schemes to extract a living from the Napa Valley, including mining and farming. Winemaking was tried only after several other ideas failed to pan out, and the wine industry itself was severely tested, first by an insect that killed almost all of the valley's vines and then by Prohibition, which eliminated the market for all but a fraction of the county's wine output (sacramental wines and grape juice production kept a few wineries afloat). Initially, Napa County contained no incorporated cities—the first city, Napa, incorporated in 1872. St. Helena became a city in 1876, followed by Calistoga in 1886. Almost 80 years would elapse before the next incorporation: Yountville, in 1965. The incorporation of American Canyon in 1992 completed what is likely the last incorporation in the county. The settlement pattern in Napa County from its earliest days mirrored that of other rural, agricultural counties, with small settlements widely separated. This pattern continued, and modern Napa County remains sparsely settled outside of the incorporated cities and town and a small number of urbanized areas in the unincorporated county. County of Napa, California, Napa County General Plan,, www.countyofnapa.org, 2009, accessed December, 2014.